I moved from classroom teacher to district-level campus support in May of 2015, and in July, my current partner came on board. In our positions as Blended Learning Specialists (brand new positions in our district), we've been responsible for the logistics of our 1:1 pilot, conducting trainings, writing grants, planning and modeling lessons, co-teaching, coordinating big events, and all the other random time-sapping things that come with being a district specialist. I've been forced to reflect on, rethink, and relearn things that I've been doing for the last 11 years that either no longer work in their current form or now don't work at all. Taking time to put on paper what I've learned about leadership, mistakes, and myself is important, so here, in no particular order, are my 12 reflections on learning to lead in edtech. My network is just as important as my knowledge. I am an introvert by nature. When I go to conferences, I sit by myself, take notes, then run out the door right as the session finishes. When I come back from a workshop, I start sentences by saying "Guess what I learned at..." By contrast, my partner actively seeks out new people to meet and talk to (shudder) and leverages what they know to enhance what she's doing. When she comes back from a workshop, she starts sentences with "Guess who I met at...?" I'm starting to see the value of blending the two approaches. In fact, I even intentionally talked to random strangers (gasp!) 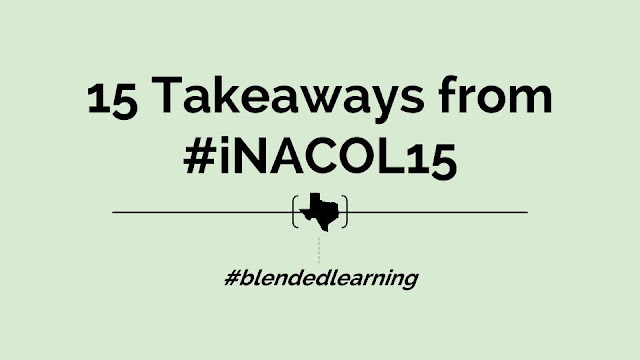 at iNACOL this year. I'm realizing that if I don't have a robust network, I'm going to end up doing a lot of work that someone, somewhere has already done. And networking isn't just about personal benefit either. It's about knowing the strengths and knowledge other people have so I can help them reach their goals too. So I'm working on my networking, and I'm starting by looking for things I have that I can offer to others and help them solve their problems. I doubt I'll ever be as good at it as my partner is, but I can learn a lot from seeing how she does it and adapting it to my personality. Effective leadership includes effective partnerships. When I was in the classroom, it wasn't really essential to learn to work with others. Yes, I was a part of a team, but when I went back into my classroom and closed the door, I could teach the way I wanted to. In leadership, that way of thinking no longer works. When there are two of you in the same role, leadership includes shared decision making. I learned this the hard way when I replied to an email on behalf of myself and my partner and spoke for both of us. Oops. She was very polite about it, but the message was clear that I needed to consult with her first before I committed both of us to anything. And she was right. I was still operating in the unilateral mindset I had when it was just me in my classroom. I'm seeing now that when we function as partners, amazing things happen. From the Google Expeditions visit to the Blended Learning grant we just submitted, her perspective and insights have been invaluable. When she pushes my ideas or probes my thinking, it helps me to find errors before they're too big to fix. I appreciate that she's willing to do that, and she's taught me a lot about respecting the opinions and experience of others. A good partner goes a long way toward doing great things. I have to shift from tactical to strategic thinking. I was a short design-loop, fast failing, rapid prototyper when it came to ideas in my classroom. I'd roll out something new first period, and by third period, it wouldn't even be recognizable. And if it didn't work like I thought it would, I just learned from it, tossed it out, and moved on to something else. That type of tactical thinking served me well then. But now, I have to think far more strategically than I ever have before. The work I'm doing as a leader affects too many people for me to fling out half an idea and ask people to act on it. I need to step back and think long-term about time, resources and the place of my plan in the entire system before I even consider rolling it out. Objectives and metrics come first, then planning and implementation. This sounds a lot like number three, but it's worth mentioning separately. When we were first planning for our 1:1 pilot, we had a pretty short time frame, so our goal was just to get devices in classrooms. Once that happened, then we worked on nailing down what exactly we wanted students and teachers to accomplish and how we were going to measure it. And although it's worked out alright, clearly this is backwards from the way we should have been thinking. For every project or plan, now I realize I need to know two things before I get started: the instructional objectives and the metrics we're going to use to assess them. It seems obvious, but it goes back to thinking strategically: my natural bent is to jump straight to thinking about what we're going to do and how we're going to do it, when I really need to think first about why we're doing it at all. Going through the Raising Blended Learners grant process really helped me with that. They had us start with an academic SMART goal first, and technology is kept out of the process until the very end. Now I'm trying to approach everything else the same way. For example, as we work on revamping edtech professional learning in our district, we're developing a profile of specific skills graduates should have when they leave us first. From there, we can identify what a student should able to do at each grade level to get there, then plan for what skills teachers need to make that happen. Objectives first, then planning. 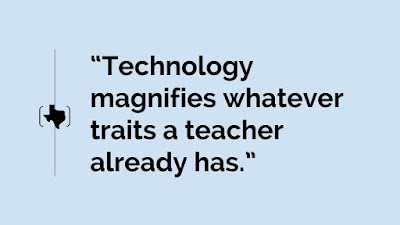 Technology simply enhances what a teacher already is. Anyone who thinks that putting technology in a classroom will magically improve teacher quality is an idiot. 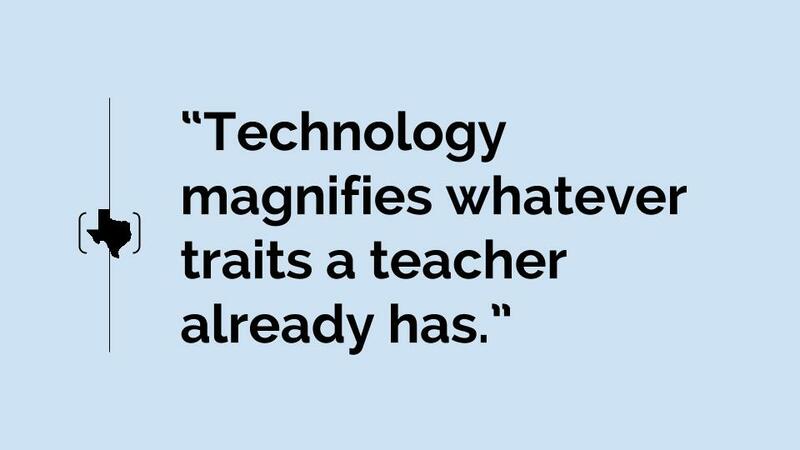 Technology magnifies whatever traits a teacher already has. If they're lecture-driven, they will turn a student's device into a way to get their lecture onto 30 screens instead of just one big one at the front of the room. If the teacher is looking for ways to give responsibility to their students, technology simply becomes the conduit to a world of knowledge so that the teacher can start facilitating instead of monopolizing attention for themselves. This is something I knew in theory, but now as a coach and trainer, I realize how true it really is. There has to be a mindset shift before technology is added to the mix. I've been very impressed by the teachers I've worked with who were traditional lecturers, but this year have taken great strides to teach their students to think for themselves. It's tough to change what you've always done, but they've shown great willingness to do things in a new way for the sake of their students. Teacher choice is essential to teacher buy-in. No one wants things done to them, and that includes plans initiated from above. If people feel powerless, they aren't going to fully commit themselves to an idea they have no control over. That's why we've tried to give teachers choices in the tools they use and how they use them in their classroom. Teachers are professionals, and they need to be treated as such. As coaches, we've tried to partner with our teachers and offer them choices, and it's had very positive results. The teachers who fully buy-in have created some amazing things we never would have thought of. And they've done so by combining their knowledge with what we've taught them about ways to integrate technology. If we had just prescribed exactly how to use the tech, those ideas never would have happened. They might have been compliant, but they never would have been creative. Professional learning is not a one-time event. This is one idea that was clear to me from the beginning. Getting teachers to where they're comfortable letting their students use technology is a big step. 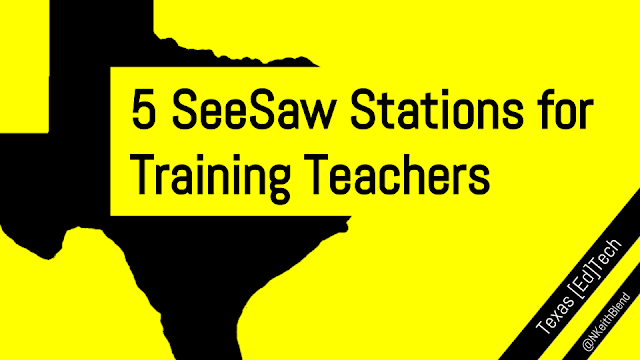 By being in classrooms, modeling instruction, being on call 24-7, and essentially living the highs and lows right along with teachers, they feel safe to try out new things. If we had simply done a workshop at the beginning of the year and stopped, we wouldn't have the same level of teacher initiative in the pilot that we have now. If professional learning is going to be ongoing, it requires understanding what individual teachers need. The process of triaging teachers into groups based on ability has helped me think about what level of support they need. Some teachers need intensive, in-class support and guidance. Other teachers just need some time to discuss lessons and activities and they're comfortable implementing on their own. Then there are a few teachers who just need me to point them toward digital resources then they really don't need me after that. Grouping teachers this way has helped me spend my limited time effectively, but I think I can be even more intentional about the process as I move into the next half of the year. In leadership, you have to deal with a lot of different people. I heard someone say this phrase earlier in the year and it stuck with me. If something can be interpreted for good or for ill, I should assume positive intent. It saves a lot of needless personal offense and keeps me from damaging relationships when they may have simply sent a poorly worded email or text. If it feeds my ego, it probably won't scale. I can enlarge my ego and make myself feel irreplaceable by forcing people to come to me for everything they need, whether it's new ideas or reset passwords. But I'm realizing that structure is unsustainable and unscalable. The more I can send teachers to others who can provide what they need, the more I make it possible for creative classroom technology use to grow without me at the center. Ultimately, that's the goal. I'm still working on figuring out how to make this happen, but I'd love to see a decentralized network of teachers pushing creative technology use in our district. This type of network would let them create and share resources and ideas, as well as push each other to try new things with their students. It may not make me feel special, but that's not the point. The point is teacher-driven, scalable, sustainable growth no matter who comes and goes at the district level. I learn more in 10 minutes of walking through classrooms than I do sending out 10 emails asking what teachers need. When something goes wrong or teachers need something, they typically just have to think on their feet and work around it to keep the lesson going. By the end of the day, they've either forgotten about what happened or have too much to do to let me know what's going on. But when I'm in classrooms on a regular basis, a thirty-second side conversation helps me know that someone's audio isn't working, the camera on a Chromebook has gone out, or that a bilingual teacher would like Google Translate on her students' devices. Being available and around is the best way to get the pulse of a project from the trenches. It's too easy to forget what it's like to be a teacher. I'm concerned that I'll forget how difficult it is to be a teacher. I try to get around that by MBWA, but it's not the same. Modeling lessons in classrooms helps some, but they're not my students with my routines and the stress that comes with managing a hodgepodge of distinct personalities day in and day out. I think about it every day, and I'm not sure what the solution is. But I know that if I forget what it's like to teach, I'll start weighing teachers down with irrelevancies instead of supporting them as they are doing the real work. And if that happens, I've failed the people I'm supposed to be serving. 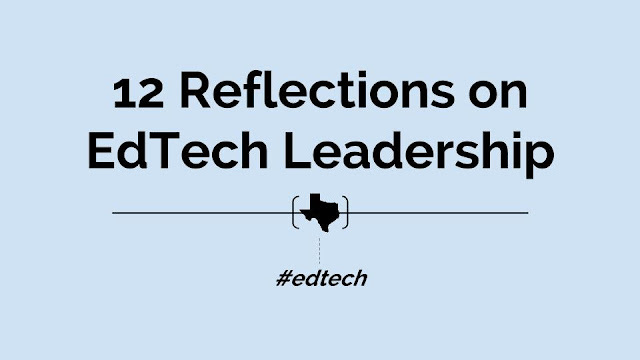 Edtech leadership is less about apps and tools than it is about philosophy, psychology, motivation, and support. 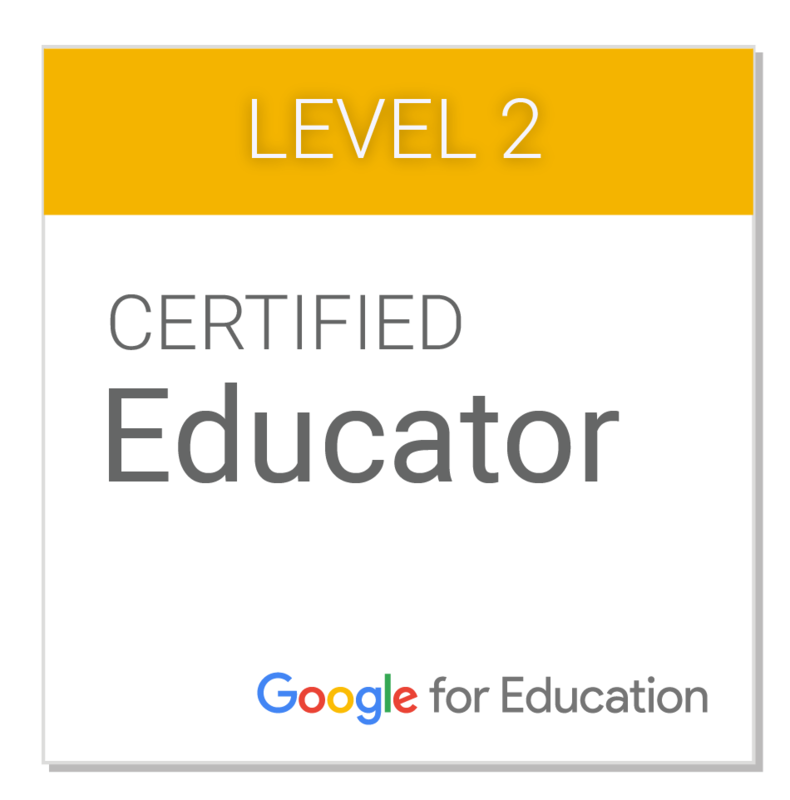 I spent all summer learning about digital tools, made sure I became a GAFE expert, and bookmarked my way to a toolbox full of Web 2.0 goodness. And those things are important. But now I see the need to have (1) a detailed philosophy of how technology should be used in the classroom, (2) an understanding of what's developmentally appropriate for students of certain ages, (3) knowledge of how to motivate professionals to change longstanding practices, and (4) awareness of the research on supporting teacher growth. All these things underpin a more robust way of thinking about the roles of teachers and students in our classrooms. They also support the hard work of planning for how to get them to where that vision is realized. So while tools are essential, deep thinking is fundamental because it dictates the framework for how the tools will be used. After seven months, this is where I am, and I feel like I'm just starting to know what questions I need to be asking. The current lesson I'm learning is to enjoy the journey and the people I meet as I'm on it. In the classroom, I focused on my work at the expense of relationships with my co-workers and colleagues. That was a mistake, and I regret it. I'm trying to remember to take the time to get to know the people around me and find out what makes them tick. If I can understand that, I can learn something from them. If I can learn from them, then I'll have another list like this in June (another seven months), full of the lessons they've taught me about continuing to learn to lead. Sometimes you just have to take one for the team and go to a conference in Disney World. And although my love for Disney and Imagineering knows no bounds, I'll save that for another post. 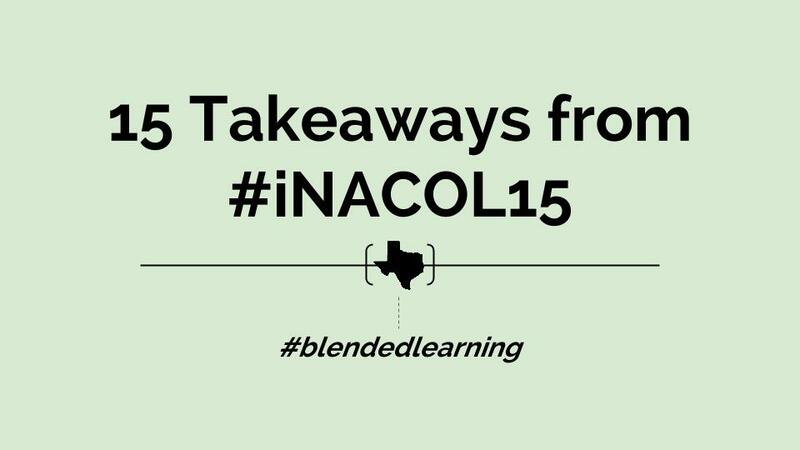 This one is focused on iNACOL. Standard conference hyperbole aside, there were over 3,000 folks in Disney's Dolphin conference center, all of whom were interested in, concerned over, monitoring closely, proselytizing the unitiated about, or just trying to get a handle on the realm of blended and online learning. HACK is a systematic way for teachers to release control to students when using technology in the classroom. It comes from Northwest Nazarene University's Doceo Center and gives a framework for moving from highly structured teacher control to knowledge (and learner) centered use. But the visual above is what drew me to HACK, where the framework is clear and not crowded out by forcing apps into categories. First, the teacher begins with Highly Structured activities in which students get use to using one system in a guided way. Then the next move is to Allowed Choices, where instead of being guided explicitly in one tool, choices are opened up to solve more complex problems with choices of digital tools. Consistent Application is the next level, where strategic reasoning and planning by the student is involved, and the technology is a transparent part of the environment. Finally, Knowledge Centered activities involve the teacher creating explorations where students are fully in control of their learning. (For a "From the Field" example of HACK, check out this ASCD article). Since this was a blended learning conference, HACK also seems like a solid path for teachers to move from simply being "technology-rich" to enabling students to learn at their own pace. It's aligned with Bloom's Taxonomy and Webb's Depth of Knowledge, and is a good conversation starter (along with SAMR and TPACK) to discuss with teachers increasing the rigor of their lessons and making the shift from lecture to facilitation. I'll definitely be exploring how to include it in our professional learning in the future. If you've never heard Bryan Setser, founder of 2Revolutions, add it to your bucket list. This man has done basically everything there is to do in education, and now runs an "education design lab" focused on innovative solutions for educational institutions. Along with The Learning Accelerator, 2Revolutions is responsible for So You Think You Want To Innovate?, an incredible tool for assessing your organization and determining if you're ready to take the leap into deeper waters of innovation. It helps you put everything on the table and start some very honest discussions about how you'll work to remove barriers to innovation in your district. Bryan's presentation riffed on the themes in the guide, but like any good jazz musician, he played well to the room, responding to questions with examples from the field and providing an understanding of organizational change that only comes from being in the trenches. He reminded me again that to have creative, sustainable change, a focus on innovation must be a priority of the system. When I heard someone say Eminence wants to be the "Disney World of Schools," I rolled my eyes. But when Superintendent Buddy Berry got up on the big stage and started sharing his (intense) passion for how every lesson should include "surprise and delight," I actually found myself leaning in to make sure I didn't miss anything. Eminence completely redesigned their district a few years back, focusing on personalized and authentic instruction, the central role of technology, and a focus on college-and-career readiness starting in Kindergarten. The district leverages everything in their power to get their students engaged and ready for college, from their "Exemplars of Eminence Excellence" to free college courses for students in high school two days a week. (And if you've seen the WiFi buses, that's them too...). Berry also highlighted the importance of "Best Practice + Next Practice." In other words, you don't leave behind best practice in instruction just because you're including new practices. It's a concept I've been trying to put into words this school year and he helped me to do it. Like with Bryan, it's impossible to summarize all the great things that came from Berry's speech, but the most important takeaway is that solving the problems of our children is going to take an innovative approach, not business as usual. Those were my three big ideas, but there was plenty of other good stuff that I'll list here for you to peruse at your leisure. Enjoy. After successfully stalking the Expeditions Pioneer program for the last 6 months, my partner and I were able to get signed up in time to be one of a limited number of stops on their internationl tour. This last Friday, the Expeditions SUV (driven by my new friend John) rolled up to our 6th grade campus and rolled out 3 travel cases with 90 Google Cardboards and the same number of ASUS phones to slip inside. 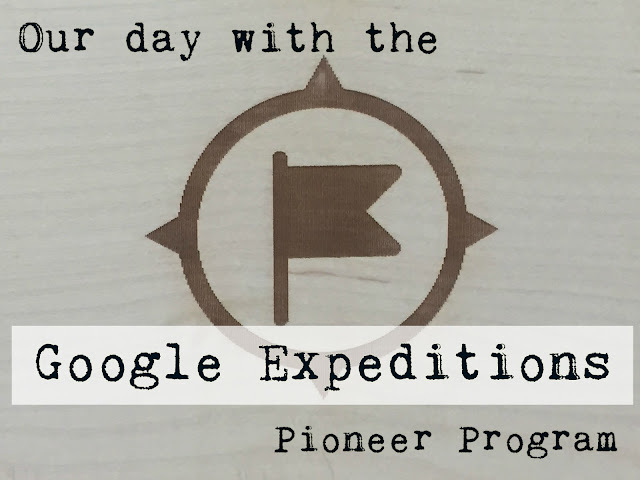 Google recommends having three dedicated classrooms to keep the Expeditions in all day, so we decided to run them through our three Social Studies classes, which meant every one of our 503 sixth graders would get a chance to take an Expedition. They're wrapping up a unit on South America, so what better way to take a virtual field trip than to take them to the 2014 World Cup? We planned our Social Studies lesson with a focus on how customs, traditions and events (like the World Cup) can unite diverse cultures in a multicultural society. We started with a quick video on the World Cup, then led into a discussion about how sports can bring people together. There was some great sharing going on as kids made the connection that even though sports are competitive, the World Cup brings together people who would typically not be together to celebrate. After that conversation, it was time to take our Expedition. We passed out the Cardboards and gave a quick set of directions. Then the kids put them on. I have never seen students so engaged in my 12 years in education. Once they realized that they were actually in Brazil, they were tapping each other on the shoulder and pointing, sharing goggles with other students to try and show them what they were seeing, and (loudly) narrating what they saw as they toured stadiums and streets during the World Cup. With Expeditions, the teacher uses a tablet that's linked to all 30 goggles to control what students are looking at. They takes students through various scenes, and within those scenes, students can explore by looking around, up and down through the panorama. Another nice characteristic of the teacher side is the information that you can pull up on the right-hand side and let students knows exactly what they're looking at (just in case you're not intimately familiar with the names of the native Brazilian artists who created works for Estádio do Maracanã in Rio de Janeiro). When it was time to come back together and put up the goggles, there was a palpable sense of disappointment. They wanted to go to other places, see other cities, and talk about what they saw. Students who had glazed over in days previous were vigorously tapping the person next to them to talk about how cool the experience was. It was awesome. Of course, anything that's a prototype is going to have its hiccups: the World Cup Expedition wasn't on two of the routers, a few of the phones kept dropping their connection, and Google's Cardboard has a slight design flaw where the phone you put in will just slide right out the side when you pick it up. But our awesome Social Studies team rolled with it. They took students on another Brazil Expedition that worked equally as well with our lesson (if not better). We got the phones reconnected. And starting second period, we just showed the kids how to hold their Goggles so as not to lose the phone (in fact, the only person who had a phone hit the floor was a teacher who had stopped in to try it out). It was an amazing, chaotic day, and totally worth it. It's experiences like this that students never forget. 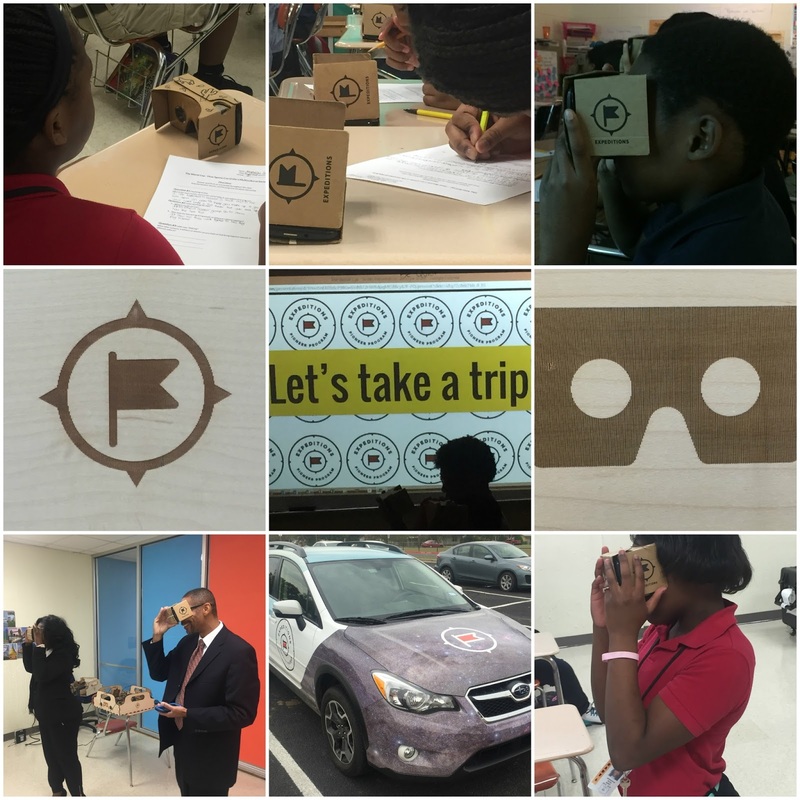 A huge thank you to Google for giving our students (many of whom have never been outside of South Dallas) the chance to travel 5,220 miles away and have their eyes opened to an entirely different world than what they've ever seen before.